Your eyes will pop when you first hold the enclosed props in your hand. The precision gimmicks and unique principle is stunning, even to seasoned magicians. 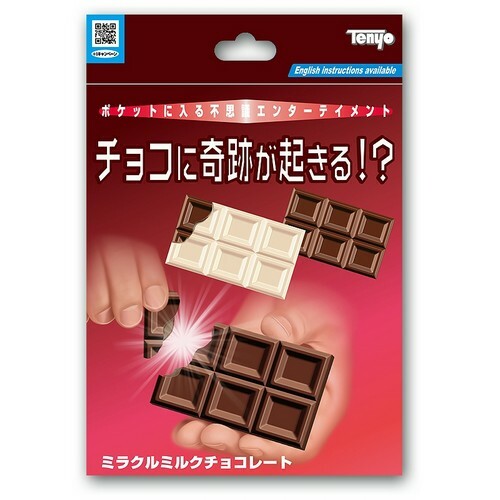 You will be able to visually make the corner of a chocolate bar disappear, and reappear on a different colored chocolate bar! At the finish, both chocolate bars completely restore to their unbroken state. The precision props are molded to look identical to real chocolate bars. If you love chocolate, magic, or both… this trick is deliciously deceptive! 2. Reattach the corner to the milk chocolate bar, and… as if by magic… the corner completely restores to the bar with no cracks or seams!